IBM Virtualization Engine TS7510 offers a new architecture for backup of open systems. 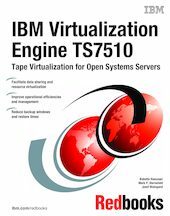 The storage industry refers to the IBM Virtualization Engine TS7510 as a virtual tape library. A virtual tape library provides high performance backup and restore by using disk arrays and virtualization software. This IBM Redbooks publication introduces you to this new architecture, walking you through the process of sizing and rearchitecting your data backup environments. It explains how you can take advantage of your tape architecture by coupling it with virtual tape. It helps you to understand how tape and tape virtualization can enhance the backup process. It presents considerations for IBM Tivoli Storage Manager. And it explains the different types of reports and monitoring aspects offered by the IBM Virtualization Engine TS7510.